Northern Territory's Adam Murrihy is living the dream right now travelling the country with his family and chasing Summit Racing Equipment Sportsman Series glory on the drag strip. So far Murrihy has taken in Championship rounds at Warwick Dragway and Mildura Sunset Strip with the Rowe Memorial next on the list this weekend (December 27) at Calder Park in Melbourne. 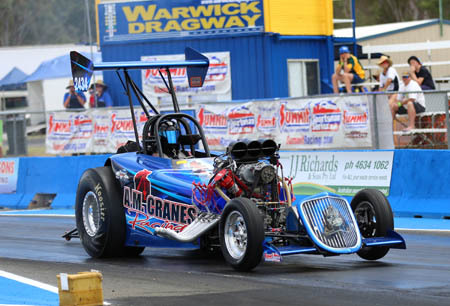 "We've travelled over 5000 km since leaving Darwin combining drag racing with family," he said. "I currently have my wife Stacey as pit crew along with my five year old Kiya, four year old Marli and my boy, two year old Riley, who at times believes he is running the whole show! "I've been very fortunate at Warwick and Mildura to have had a few guys help me out on the car that have helped me in the past which is very nice and I thank them for their travel and time. "Racing at Warwick and Mildura, both being eighth-mile tracks, I have not raced on in over 15 years. It took a little bit of getting used to having to get off the gas and get the chutes out quick, as the altered can get a little bit upset in the deep part of the track." Besides racing and experiencing different tracks, Murrihy has most enjoyed the people extending his young family of five to a road family of many. "The people we have met along the way have been fantastic and more than helpful. I'd like to thank the Loy family and Warwick Dragway for supplying me with methanol for the weekend which was donated to me for having travelled from Darwin. "And all the committee and volunteers in Mildura for all the help while the car was broken in the pits leading up to the event. We couldn't have made it to the race day and put a show on without their help. It's a great club, great track, with awesome people! We will go back for sure. "To date it has been a cross between family trip around Australia and drag racing which has included a new trailer to accommodate the family as we camp in the trailer the car is stored in. "Towards the end of the series will be flying back to Darwin and the car will be stored in a fellow racers shed who also races Supercharged Outlaws. We will fly in and out as required so thank you Justin Russell for accommodating our needs." Russell will be one of several tough Outlaws competitors alongside regulars Doina Day, Ryan Van Dyk, Jason Keily and Paul Stephen at the Rowe Memorial this Sunday December 27 at Calder Park Raceway. The event doubles as Round 6 of the Summit Racing Equipment Sportsman Series and will be Murrihy's first look at the track since 2001 when he completed an 11.2-second pass in a two-door nitrous HQ Monaro. "I was 21 at that time and would not have dreams of doing a six second pass so with the new upgrades at the Calder Park track I can't wait to get there and see what the track as to offer my little altered. "Living and racing in Darwin we have a limited number of Supercharged Outlaws cars so we find ourselves racing aspirated, nitrous and turbocharged cars (on this trip) and it makes a nice change to follow the Series and race against Supercharged cars of all makes, sizes and body shapes that all have the same challenges. "At the end of the day it seems to be whoever is most comfortable with their car, themselves and the track that takes home the grand prize. It's a very competitive class of racing which I really enjoy."